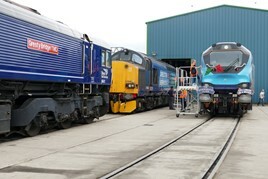 More than 4,000 visitors attended Direct Rail Services’ open day at Crewe Gresty Bridge on July 21. This helped DRS raise £37,351 its Sponsorship and Donations Fund. Having a widely spread presence across the country, DRS supports good causes based on requests and recommendations from staff. Examples from every class operated by DRS were on display, including two Class 68s that had returned from the Velim test track in the Czech Republic only days previously (68019 Brutus and 68021 Tireless). Two locomotives were named, with Crewe & Nantwich MP Laura Smith christening 66421 Gresty Bridge TMD (a name previously carried by 20305), while 57007 was named John Scott 12.5.45-22.5.12 after a former DRS fitter (this name was previously carried by 47805). For more on this story, read RAIL 859, published on August 15, and available digitally on Android/iPad from August 11. Read RAIL 859 for an EXCLUSIVE interview with DRS regarding its traction policy, published on August 15, and available digitally on Android/iPad from August 11.